It’s been super hectic this April with extensive traveling and tons of craziness. I was in Goa the second time this year to attend the Rubyconf. This is an annual event where Rubyist developers and upstream contributors meet from across India. The event featured keynotes & talks from core Ruby developers who came from abroad to present at the conference. I enjoyed the event and it was a delightful experience for me. My primary role was to represent The New Stack , as the immediate media sponsors for the event held in Goa this year. At the Rubyconf meet, I interacted with many newcomers, made few friends and improved my knowledge on Ruby to a greater extent. Like always, Gautam, Ponappa, Ajey and Satish did a tremendous job in organizing the event and making it a definite success. I’m proud to reveal that this was the first event which had functional WIFI setup. It seems vital to keep testing and tests mainly outside the core codebase. I became aware about functional programming and how modularizing code into small chunks can actually make life so much easier. It was pointed out that 80% of the time newer developers spend time reading code written by others. It was very interesting to know more about codeclimate use case of Ruby. Rails has given all the power and added buzz for Ruby to go mainstream. Rails needs to be made faster and I am sure newer releases will focus on same. 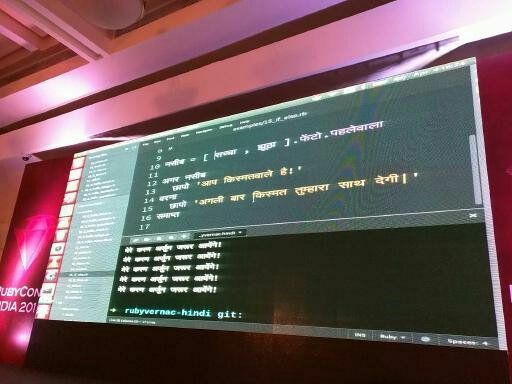 One highlight was an interesting talk/demo where the speaker demonstrated writing Ruby programming in one’s mother tongue. The entire initial devops movement has Ruby as one key programming language. Most people use Ruby for quicker development and not just for performance. Ruby has many frameworks and is indeed a large ecosystem that is being utilised at many places even in a mission critical environment. It was hearty to note that the organizers provided scholarship to many students that included free stay/travel to attend this event. Honestly, this is a perfect way to foster the overall ecosystem. A lot of interesting things were shared among speakers that increased and improved my knowledge of the language and its importance. I hope this continues yearly especially for all who want to benefit from Ruby and are aspiring to learn and code in Ruby. Lastly, in true Goa style,the event ended on a high by an organised beach side party with Karaoke that had everyone thoroughly enjoying the event. Notes from Chris Sacca/Jason This week in startup conversation.